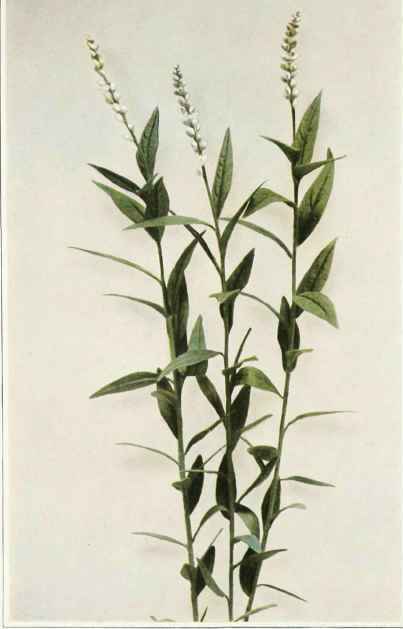 Stems usually several from a perennial, woody rootstock, ascending or erect, 5 to 18 inches high, usually simple, occasionally branched above, glabrous or nearly so. Leaves alternate, the lowest ones very small, closer together and scalelike, the upper ones oblong-lanceolate or ovate, sometimes lanceolate, sessile, 1 to 2 inches long, about one-fourth to one-third of an inch wide, minutely toothed. Flowers white, sometimes tinged with green, in dense, terminal, pointed spikes, 1 to 2 inches long. Each flower about one-eighth of an inch long; wings of the flower orbicular-obovate, concave; crest of the corolla short and few-lobed. In dry or rocky woodlands, New Brunswick to Hudson bay and Alberta, south along the mountains to North Carolina and west to Missouri and Arkansas. Flowering in May and June.